George is situated just inland from Victoria Bay on the Cape Garden Route. The heart of the Garden Route and capital of the Southern Cape, George is the ideal hub from which to explore the diverse scenery and natural wonders of its surrounding areas. George nestles at the foot of the Outeniqua Mountains. Our airport connects you to and from all the main centers in South Africa and main roads and rail, link with the Klein Karoo hinterland. This is an ideal place to begin your holiday. No special health precautions are necessary. Whilst George is mainly a holiday destination, many families have relocated to this most attractive town, which is located in one of the fastest growing areas in South Africa. George, as the largest of the Garden Route towns, is also considered the industrial and business hub of the Southern Cape Region. The main N2 highway linking Cape Town to Port Elizabeth with all the unique coastal towns in between form the unmistakable Garden Route with George as a vital central point, with its international airport and convenient centralized location. Red Berry Farm where you pick your own strawberries. They also offer an outdoor tea garden and fresh farm stall. The Dutch Cheese Farm for wine and cheese tasting. The Bado Kidogo Bird Farm is a breeding farm open to the public and viewing can be done 365 days a year. Garden Route Botanical Gardens is the only botanical garden on the Garden Route. 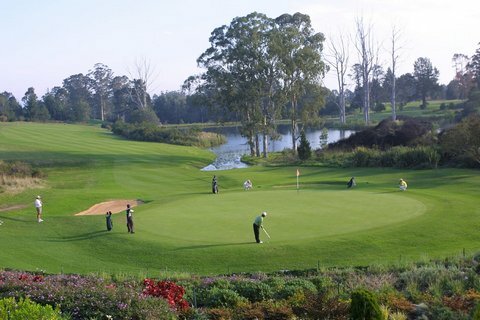 Golf: One of South Africa’s premier golfing destinations with ten courses, driving ranges and a world-class golf academy. Hiking, mountain-biking, bird-watching and indigenous fynbos. Surfing at Victoria Bay and Herolds Bay. The Outeniqua Country Hop Route meanders through the Blanco and Geelhoutboom area and has arts and crafts, hikes, golf, hops farms, eateries and accommodation. Board the Outeniqua Power Van for an excursion on the Outeniqua Mountains. Scenic passes are the Montagu Pass and Seven Passes Road. George Museum and other historical buildings. 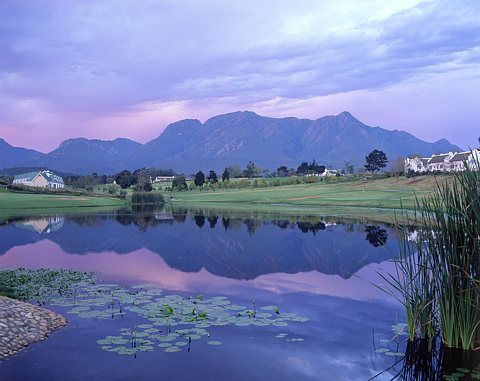 For the golfers, Fancourt Hotel & Country Club Estate is South Africa's premier golfing and leisure resort. Set in the most breathtaking scenery it is a must see, as is the Garden Route Botanical Garden and the Outeniqua Nature Reserve. For the more active traveler, there are many hiking and mountain biking trails, while canoeing down the Kaaimans river is a great opportunity to get close to nature, and abseiling down the river gorge is pure adrenaline.